Thanks to on-site plant visits by Georgia Tech students to evaluate energy-saving opportunities at Beaulieu of America, the carpet manufacturer discovered it could reduce its utility use by almost 15 percent with an estimated annual savings of $2 million, reports Georgia Tech Enterprise Innovation Institute. The site visits addressed energy issues important to the specific plants including energy management, boilers, steam systems, large motor and drives, and compressed air systems. Based on the assessment data, Bob Hitch, a project manager with EI2 and other energy specialists at Georgia Tech made energy conservation recommendations for each facility. In addition to the energy conservation projects, DNR helped Beaulieu with its water conservation efforts. Based on the group’s recommendations, the carpet manufacturer could save more than 25 million gallons per year, or $81,600. Six months into the implementation, the team has already achieved $60,000 in savings. To read the full article in Environmental Leader, click here. Installing biomass energy systems can greatly reduce a company’s operating costs, create a cost-effective and cleaner way to produce energy, and reduce its carbon footprint – if managers, engineers and environmental health and safety professionals understand renewable fuels and the equipment required to convert these fuels into energy. A group of Georgia Tech alumni and researchers now have in print a comprehensive book on this subject, Biomass and Alternate Fuel Systems: An Engineering and Economic Guide. The book is a joint publication of the American Institute of Chemical Engineers and John Wiley & Sons. It is an update and significant expansion of the Industrial Wood Energy Handbook written by the same Georgia Tech team in 1984. The book explains characteristics of renewable fuels, especially biomass and wood, and the cost-effective and environmentally friendly methods for handling, storing, burning and converting these fuels into heat, steam, power and chemicals. Wood refers to renewable fuel generated from trees and comes in forms that include bark, sawdust, shavings and whole tree chips. Biomass — a more general term referring to fuel generated from any type of plant life — includes trees, agricultural residue, biogas, and small, fast-growing plants like switch grass and algae. 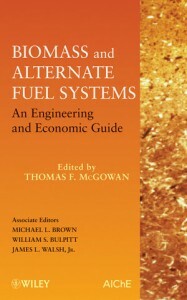 The book also includes economic evaluation methods; information on furnaces, boilers and gasifiers; pollution control equipment to limit emissions from biomass combustion; production of liquid fuels from biomass; a case study and feasibility study; costing; and calculation methods for greenhouse gas and carbon emission comparisons between conventional and alternate fuels. The editors of the book are all Georgia Tech alumni: McGowan (Industrial Management, 1985), Brown (Mechanical Engineering, 1973 and Management, 1987), William Bulpitt (Mechanical Engineering, 1970 and 1972) and Jim Walsh (Aerospace Engineering, 1969 and 1970) have more than 140 years of experience among them. McGowan was a senior research engineer at the Georgia Tech Research Institute (GTRI) from 1978 to 1985, and Bulpitt recently retired as a senior research engineer with Georgia Tech’s Strategic Energy Institute. Brown and Walsh are both senior research engineers with Georgia Tech’s Enterprise Innovation Institute. Bostik is a world leader in adhesive and sealant manufacturing. In 2008, the company employed 5,000 people across 48 manufacturing sites and 12 research centers, and generated nearly $2 billion in business. With such an expansive and diverse company, it made sense that Bostik’s parent company would mandate an energy reduction program to keep costs under control. In Calhoun, Ga., the 23 Bostik employees operate on a smaller scale, but they still need to use energy efficiently. Ray Davis, plant manager, and Dan Conetta, production manager, selected Georgia Tech’s Enterprise Innovation Institute (EI2) to help implement their energy reduction program because of its expertise in energy reduction and lean manufacturing. EI2 offers Georgia manufacturers a three-step program to identify and implement operations for immediate energy cost savings, adopt a system of best practices to sustain energy cost reductions and assist with certification in ANSI/MSE 2000-2008, a national standard for energy management adopted by the American National Standards Institute. Jessica Brown, an energy specialist with EI2, visited the Calhoun facility to identify areas where energy improvement could be realized, communicated industry best practices and provided advice and consultation on the procurement of diagnostic tools for energy reduction purposes. She made a number of recommendations for Bostik, including utilizing more efficient fluorescent bulbs, reducing peak load by staggering equipment startup, relocating the air compressor intake from indoors to outdoors, discontinuing the unnecessary use of compressed air, reducing boiler blow-down in the summer, recovering steam condensate and properly insulating the boiler and steam piping. According to Conetta, the results of Brown’s assistance have been significant: Bostik has reduced its energy consumption by an estimated 56 percent, saving $40,000. Employees have expanded their knowledge of energy reduction practices and Georgia Tech continues to be a resource to facilitate continuing education in energy reduction. As part of the U.S. Department of Energy’s Industrial Assessment Center (IAC) program, Georgia Tech can provide energy, waste and productivity assessments at no charge to small- and mid-sized manufacturers. Conetta also notes that the energy audit yielded non-monetary results: a “cultural shift” towards energy reduction awareness and a reduced corporate energy footprint. Industrial Assessment Centers – like the one based in Georgia at Georgia Tech’s Enterprise Innovation Institute – provide energy, waste and productivity assessment at no charge to small and mid-sized manufacturers. Assessments help manufacturers maximize energy efficiency, reduce waste and improve productivity. On average, recommended actions from an assessment result in annual cost savings of $55,000. The assessments are performed by teams of engineering faculty and students from more than 26 participating universities across the country. Work is funded by the U.S. Department of Energy Office of Energy Efficiency and Renewable Energy. Savannah, the “Hostess City of the South,” is known for its southern hospitality and charm, but it is also making a bid to be known as environmentally friendly. Already, the City has implemented a number of initiatives, including converting all of its traffic lights to more energy-efficient and long-lasting LEDs, expanding use of treated wastewater for irrigation and implementing a much-anticipated single-stream curbside recycling program. In August 2008, Mayor Otis Johnson held a town hall meeting to pledge that the City of Savannah will be a more environmentally sustainable community and to launch a new sustainability initiative, dubbed Thrive. However, Johnson wanted to focus on leading by example rather than making policies that force citizens to get on board with the program. Rachel Smithson, Thrive coordinator for the City of Savannah, began collecting data to establish the City’s carbon footprint. The City conducted employee commuter surveys and analyzed electricity consumption, fuel usage and gas emissions. By plugging all of this data into a formula created by the International Council for Local Environmental Initiatives, Smithson realized that Savannah city government produces roughly 75,320 tons of equivalent carbon emissions per year. After studying the carbon footprint data, Smithson noticed that city government buildings were the number one source of energy consumption, a trend that coincides with national data. The Thrive Committee decided to focus its initial efforts on buildings, and through its connection with the Georgia Environmental Partnership, called on Georgia Tech’s Enterprise Innovation Institute for assistance. One of the most comprehensive university-based programs of business and industry assistance, technology commercialization and economic development in the nation, the Enterprise Innovation Institute has a local office on Georgia Tech’s Savannah campus. Mike Brown, an energy specialist with the Enterprise Innovation Institute, and two Georgia Tech co-op students conducted energy audits at three government buildings: City Hall, the Thomas Gamble Building and the Broughton Municipal Building. All three are designated historic buildings, and house the mayor’s office and council chambers, human resources, information technology, auditing, utility services and revenue, among others. Brown and the students placed data loggers in each of the buildings, measuring temperature, lighting and energy consumption, even over nights and weekends. They studied each building’s energy consumption history and measured the major energy-consuming equipment. Among the recommendations that the Georgia Tech specialists made were: replace incandescent lamps with compact fluorescent lamps, improve fluorescent lighting efficiency by replacing T-12 lights with T-8 lights, and manage the building plug-load. They also recommended installing occupancy sensors in restrooms, vending machine controllers to reduce lighting and cooling, a building automation system to automatically control HVAC systems, and variable-air volume fans to match air flow with cooling needs. According to Smithson, the biggest challenge now is implementing Georgia Tech’s recommendations. 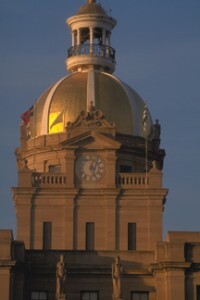 As part of the 2009 American Recovery and Reinvestment Act, the City was able to establish a revolving loan with its stimulus funding. Although the City cannot implement all of the recommendations immediately, Smithson says that as soon as one investment is paid back, another project can begin with the energy savings from the previous project. Already, the benefits are outweighing the challenges. Georgia Tech’s assistance allowed the City to have an energy conservation strategy in place, a requirement of the stimulus funding application that some cities have spent more than $250,000 to obtain. And although a lot of investments have yet to be made, electricity expenditures were $350,000 below what the City had targeted through May 2009, something Smithson attributes to changing employee behavior alone. When entrepreneurs Sherrie Ford and Steve Hollis purchased an Athens manufacturing facility previously owned by the Swiss conglomerate ABB six years ago, one of their first items of business was to realign the company’s mission. Founded in 1958 by Westinghouse, the 400-employee company now known as Power Partners continues to manufacture the pole-type distribution transformers that help bring electric power to homes and businesses throughout the world, but with an innovative business angle. In 2007, Power Partners expanded its product line to manufacture solar water heater systems, which use solar energy to heat water and can provide up to 85 percent of the energy needed to produce domestic hot water. Systems are composed of solar thermal collectors, a fluid system that moves heat from the collector to the point of usage. According to commercial operations manager Scott Childs, Power Partners is initially marketing the systems to utility companies and dealers. In addition to the distribution transformers and the solar water heater systems, Power Partners has the exclusive North American rights to begin manufacturing adsorption chillers, a product that can substantially reduce operating costs by converting waste heat into cool air. Ford says she is excited about the new product’s potential. “When combined with other technologies, adsorption chillers create about as low an impact on the environment as you can get. This is really going to revolutionize the way architects and construction firms think about their designs,” Ford said. With all of the focus on manufacturing environmentally responsible products, it made sense for Power Partners to examine its own manufacturing processes. After working on projects in lean manufacturing and quality standards with Georgia Tech’s Enterprise Innovation Institute, Ford contacted the organization again to conduct an energy assessment. In July 2008, Bob Hitch, a project manager with the Enterprise Innovation Institute, evaluated Power Partners’ process heating systems – annealing, welding, drying and painting – for potential energy-saving opportunities, an estimated energy savings of 30 percent. As a result of the recommendations, Power Partners is replacing its water-cooled bearings with high-temperature graphite bearings. Earlier assessment of the general facility energy usage by Hitch and the Power Partners engineers led to the update of lighting in the plant to T5 and T8 high-efficiency units, and replacement of outdated air compressors. Power Partners also participated in a November 2008 project for the Green Supplier Network, a partnership between the Environmental Protection Agency and the National Institute for Standards and Technology’s Manufacturing Extension Partnership. In addition to Hitch, the project was facilitated by Bill Ritsch of the Enterprise Innovation Institute and Dan Loudermilk of the Georgia Department of Natural Resources’ Pollution Prevention Assistance Division. The work was sponsored by Power Partners’ customer, Pepco Holdings, Inc. The improvement ideas included operating the paint line during one shift only, creating a single point of contact for ordering tanks, rearranging the tank wall inventory to minimize travel, reconfiguring conveyors to improve material flow, minimizing repair stations by combining repairs where possible, and re-using the waste water from the paint area. However, Stonecipher says that the most significant improvement was completing a “green” value stream map for all plant processes. Power Partners realized other benefits as a result of the Green Supplier Network Project. Tank inventory was reduced by 34 percent, total supply chain lead time for tanks went from more than 17 days to less than a week, water usage was reduced by 10,000 gallons per day, quality improved and productivity increased. Stonecipher notes that while not all of the results were measurable, they were all beneficial. Power Partners, which was recognized in 2007 as the seventh largest woman-owned business in America as certified by the Washington, D.C.-based Women’s Enterprise Business National Council, plans to use Georgia Tech’s assistance in the future to focus on pumps and motors, as well as ways to capture waste heat and re-use it so it can install its own adsorption chiller. “We are people who are continually looking for creativity and innovation, and doing things that are not business as usual,” said Ford. 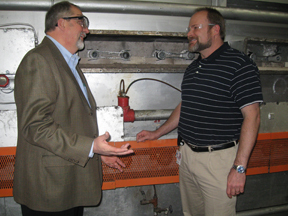 Thermal Ceramics, an Augusta-based insulation manufacturer, has always been at the forefront of its industry. It is a world leader in the production of ceramic fiber products and insulating firebricks, as well as specialty insulation products. With more than 3,000 employees in more than 30 locations worldwide, Thermal Ceramics supplies customers in the petrochemical, chemical, automotive and power generation industries. In the early 1990s, the Augusta, Ga. facility became ISO certified, meaning it was independently audited and certified to be in conformance with quality management standards maintained by the International Organization for Standardization (ISO). However, by 2005 the system had begun to lose its relevance. Elliot Price, Deann Desai, Don Pital, Holly Grell-Lawe and Dennis Kelly, all Georgia Tech quality specialists, assisted Thermal Ceramics with re-tooling its quality management system. ISO 9001 is an international quality management system standard that presents fundamental management and quality assurance practices applicable to any organization. Companies that are ISO 9001 certified have a demonstrated baseline of managerial discipline and control, and they also have higher rates of customer satisfaction. Throughout the process, the Georgia Tech team reviewed the company’s documentation, developed a system that had a more value-added process and identified training needs. Team members also conducted a gap audit, helped with the development of an implementation plan, assisted with initial internal audits and management review, conducted a pre-assessment audit and corrected any system issues prior to the registration audit. ISO 14001, the international specification for an environmental management system, helps organizations develop a process to reduce negative environmental impacts caused by their operations while also complying with applicable laws and regulations. Like ISO 9001, ISO 14001 focuses on the process rather than the end product. 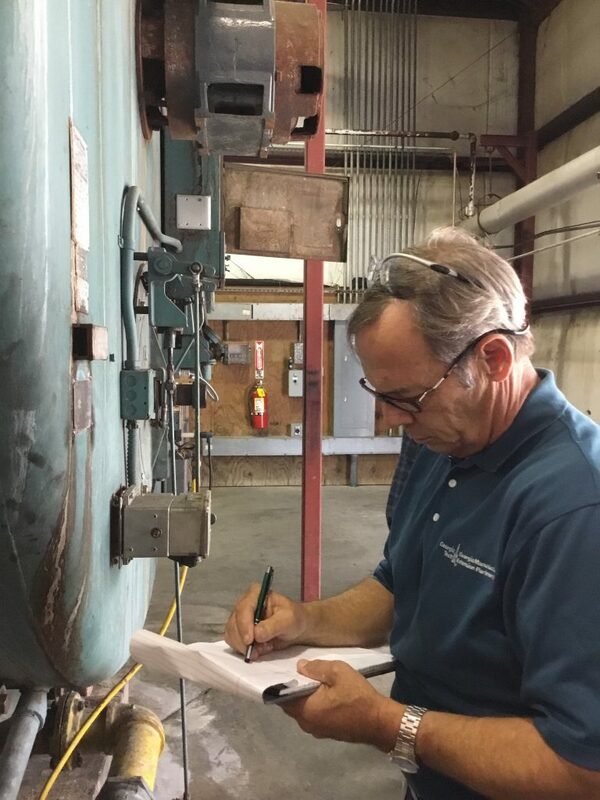 The Georgia Tech team helped Thermal Ceramics integrate the two standards into one, and served as the company’s internal auditors. Pettigrew estimates that as a result of becoming ISO 9001 and 14001 certified, Thermal Ceramics was able to increase its sales by $6 million while saving $2 million in costs. The company, which employs a total of 450 people at its Augusta facility, was also able to add seven employees. On the heels of its quality and environmental standards success, Thermal Ceramics also sought assistance from the Enterprise Innovation Institute in the area of lean management principles, a set of tools that helps organizations identify and steadily eliminate waste from their operations. Paul Todd, a Georgia Tech lean specialist, led an executive introduction to lean, a 5S overview and planning session and 5S training and implementation. 5S refers to five Japanese words: seiri (remove what is not needed and keep what is needed); seiton (place things in such a way that they can be easily reached whenever they are needed); seiso (keep things clean and polished); seiketsu (maintain cleanliness after cleaning); and shitsuke (sustain the improvements over time). In English, the steps become sort, set in order, shine, standardize and sustain. Currently, Thermal Ceramics is conducting lean projects in the areas of energy reduction, downtime reduction, safety, increasing melting efficiency, and shipping error reduction. Weekly 5S meetings are also held to maintain the momentum. 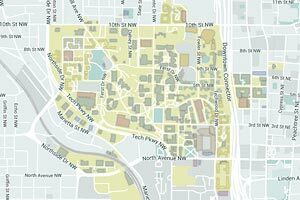 In December 2007, the Augusta operation of Thermal Ceramics – which spans 58 acres and 10 buildings – sought Georgia Tech’s assistance in the high-impact area of energy management. As part of the U.S. Department of Energy’s Industrial Assessment Center program, Georgia Tech’s Enterprise Innovation Institute can provide energy, waste and productivity assessment at no charge to small- and mid-sized manufacturers. Mike Brown and Pierpaolo Baldisserotto, Georgia Tech energy specialists, visited the Thermal Ceramics plant to evaluate the company’s challenges, problems and solutions. They studied the facility’s energy consumption history and measured the major energy-consuming equipment. Along with several Georgia Tech co-op students, they produced a report that included a number of recommendations, including recovering fiber waste, recovering heat from the kiln exhaust, repairing air leaks and replacing desiccant air dryers with refrigerated dryers. The report estimates that Thermal Ceramics could save more than $1.8 million – 22 percent of the facility’s annual energy costs – by implementing its recommendations. Rotary Corporation, headquartered in Glennville, Ga., literally began from a car trunk when J.D. Nelson began selling replacement parts to auto parts stores and lawnmower dealers in 1956. By 1971, the company’s volume had increased to the point where Rotary began considering manufacturing its own lawnmower blades. To make an informed decision, it enlisted experts at Georgia Tech to conduct a feasibility study. Today, Rotary employs 450 people and delivers parts to 20,000 customers in all 50 states and more than 50 countries throughout Europe, Asia, South America, Canada, Australia and Africa. To support that growth over the years, Nelson continued to turn to Georgia Tech for assistance and guidance. Georgia Tech’s Enterprise Innovation Institute provides comprehensive services to improve the competitiveness of Georgia’s business and industry, including technical and engineering assistance, continuing education courses, facilitation of networks and connecting companies to Georgia Tech resources. 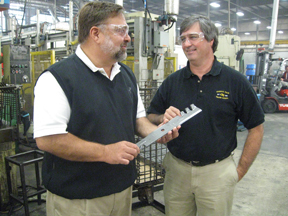 Since the initial feasibility study on lawnmower blade manufacturing, Rotary has tapped into nearly every service offered by the Enterprise Innovation Institute. In the mid-‘70s, Georgia Tech conducted another study to determine the best steel for blade manufacturing. Energy and environmental specialists have performed air sampling, noise monitoring, general safety audits and environmental audits, and assisted the company on better managing its energy costs. Rotary has also thoroughly utilized Georgia Tech’s services in lean manufacturing, a process management philosophy derived mostly from the Toyota Production System and known for reducing wasted time and effort. Alan Barfoot, a lean specialist and central Georgia region manager with the Enterprise Innovation Institute, led Rotary staff in a lean overview, helping participants learn the principles of lean manufacturing and how to apply them. During a series of simulations, they applied lean concepts such as standardized work, visual signals, batch-size reduction and pull systems, among others. They experienced how lean improves quality, reduces cycle time, improves delivery performance and reduces work-in-process. The team also developed value stream maps – diagrams used to analyze the flow of materials and information required to bring a product or service to a consumer – to determine Rotary’s current and future states. Nelson estimates that Rotary’s available warehouse space increased by 20 percent as a result of these projects. In 2007, the Enterprise Innovation Institute – through the U.S. Manufacturing Extension Partnership (MEP) – began offering a program to help Georgia companies develop new strategies for growth. “Eureka! Winning Ways®,” an award-winning three-step process that includes idea engineering, success screening and action-plan coaching, was developed by Doug Hall, former master marketing inventor with Procter & Gamble and former host of the ABC television series American Inventor. Eureka helps companies assess how to best jump-start growth through innovative and creative ideas. Projects, which are led by Georgia Tech experts who have been certified in the Eureka Ranch techniques, examine how companies can establish more effective marketing messages, capture new customers or markets, and develop new products, services or business models. In fall 2007, Rotary was invited to Eureka Ranch, Hall’s headquarters in Newtown, Ohio. Following the idea generation, the group refined and rewrote the top 12 ideas, and then senior management selected four to go into idea testing. That testing took place in the second phase of Eureka, which assesses ideas using Merwyn Research, a software program that evaluates the group’s ideas based on other ideas’ successes. The software generates a score for each idea and, based on that information, the client chooses two ideas on which to focus. The third phase of Eureka – TrailBlazer – is a 30-day research-intensive coaching process to make a decision on whether to develop the two ideas. If the decision is “yes,” the idea will proceed into a development phase. Over time, the goal is for the company to have a continuous “idea pipeline,” with ideas in different stages of incubation and development. Another project that was immediately identified by the Eureka process was an information technology project that remedied the problem of Rotary’s computer system being down during back-up. Now, the ordering system is always accessible, a big improvement for Rotary’s European customers in particular. Nelson says that Rotary has experienced a number of positive impacts as a result of the Eureka project, including $1.5 million in increased sales, $2 million in retained sales that would have otherwise been lost, 50 retained jobs and one job created. He also notes that Rotary avoided $262,000 in unnecessary investments as a result of Georgia Tech’s assistance. “Eureka really opened our eyes to other ways of doing things, and helped us to take advantage of ideas as fast as we can. We’ve got a lot more ideas now than we had in the past,” Nelson said. Media Relations Contacts: Nancy Fullbright (404-894-2214); E-mail: (ude.hcetag.etavonninull@thgirblluf.ycnan) or John Toon (404-894-6986); E-mail (ude.hcetag.etavonninull@noot.nhoj). Energy and sustainability experts at the Georgia Institute of Technology have taken a leadership role in the U.S. contribution to a 36-nation effort aimed at developing an international standard that would bring consistency to energy management systems worldwide. The effort has implications for the public and private sectors alike, providing a process for managing energy use and implementing sustainable practices that would help hold down costs and minimize environmental impacts. This first-ever international energy management system standard – to be known as ISO 50001 – would also level the playing field for companies competing in the global marketplace. With broad applicability across economic sectors, the standard could ultimately affect as much as 60 percent of the energy used in the world. Beyond the direct benefits, adoption of ISO 50001 could also lead to long-term cultural changes that benefit organizations in other ways. “An energy management system standard establishes a culture of continual improvement to sustain the gains made, placing the organization in a position to realize even greater energy efficiencies and further savings,” Meffert added. The U.S. Department of Energy is supporting the effort through a combination of active participation in the U.S. Technical Advisory Group (TAG) and through financial support for the administration of the U.S. TAG. The U.S. TAG is responsible for developing the U.S. consensus position on the proposed standard. Rising energy prices have made managing energy a higher priority for industrial, commercial and governmental organizations worldwide. Beyond helping manage costs and controlling environmental impacts, large energy users may be driven to adopt the voluntary standards as evidence of their good corporate citizenship. Companies that adopt the new standard may also gain a public relations and marketing advantage. “Companies that conform to an international energy management system standard will be publicly stating that they have adopted best practices for managing their energy supply and use, which helps make them competitive,” Meffert added. “They are also showing that they are managing their natural resources wisely. Many companies will also want to ensure that their suppliers and partners are environmentally responsible. In general, Meffert noted, standards are useful to helping organizations establish the order and consistency to manage key business components, whether they address quality, environmental protection or energy issues. While industry has driven development of the new standard, it could be used by any energy-consuming organization. The standard will define a management system for all energy sources – including electricity, liquid and solid fuels, renewable sources, steam, compressed air and chilled water. The new ISO 50001 is being developed through a consensus process of the International Standards Organization (ISO) that involves representatives from national standards organizations in more than 36 countries who develop proposals, discuss issues, build consensus – and adopt the final standard. The United States and Brazil are leading the overall effort under ISO’s framework. In addition to member nation representatives, two liaison members – the United Nations Industrial Development Organization and the World Energy Council – are also contributing to the effort. The ISO/PC 242 committee established to develop the standard held its first meeting in Washington in early September, and will hold additional meetings on a regular basis. The goal is to have ISO 50001 ready for publication by the end of 2010, said Deann Desai, project manager with the Enterprise Innovation Institute who serves as secretary to the U.S. TAG. Georgia Tech was heavily involved in developing the existing American National Standards Institute (ANSI) MSE 2000:2008 standard for energy management systems. That standard has seen limited adoption in the United States, but Meffert said globalization of commerce now requires an international standard that will be widely adopted. Georgia Tech worked closely with the Department of Energy in activities leading up to the formal launch of the ISO 50001 development effort. Members of Georgia Tech’s energy and sustainability staff helped develop a comparison document that was used to facilitate initial international meetings, and they participated with ANSI in the process of producing an application to ISO explaining the need for the new standard. Georgia Tech’s Enterprise Innovation Institute is administering the U.S. Technical Advisory Group (TAG) for ANSI. The group is composed of many energy management experts and helps shape the U.S. position for the international standard. Organizations interested in participating should contact Deann Desai at (706) 542-8902 or (ude.hcetag.etavonninull@iased.nnaed).